Montreal, 7 April 2016 – A large, attentive and enthusiastic crowd was on hand on 5 April at the Phi Centre, when the Maison de l’architecture du Québec (MAQ) presented this edition’s awards for the MAQ Young Architectural Critic Competition, held with the support of The Royal Architectural Institute of Canada (RAIC). Under the banner “A Library for the 21st Century,” more than 20 Canadian library buildings were subjected to the critical analysis of competitors aged 34 years old and under from across the country. With a record 88 submissions (23 in French and 65 in English), this 4th edition of the MAQ Young Critics Competition, created in 2011, was an unprecedented success. The jury was keen to underscore the improved analytical and written quality of this year’s submissions. 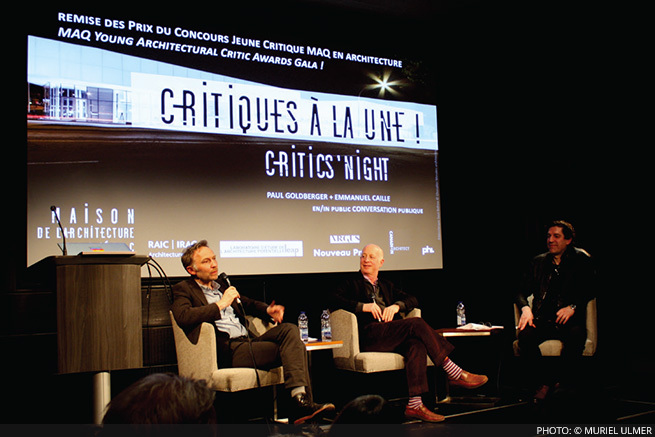 A public conversation between distinguished international guests Emmanuel Caille, editor-in-chief of d’architectures (Paris) and celebrated New York author and critic Paul Goldberger, and moderated by professor Jean-Pierre Chupin, was the highlight of the event. Ewa Bieniecka, FIRAC, Vice-President of the RAIC, opened the evening by stressing the importance of having a strong presence in architectural criticism in both social media and the press, which was the main theme of the event. Paul Goldberger was optimistic as he emphasized the importance of initiatives such as the MAQ Young Critics Competition in this difficult transitional period for print media. His advice to the aspiring authors in the audience? Keep writing! First prize (French criticism) was awarded to “Une bibliothèque à coeur ouvert,” by Marie-Pier Bourret-Lafleur, a 25-year-old French literature graduate student at McGill University. Her text on the Marc-Favreau library designed by the Dan Hanganu firm is now available in the 2016 spring-summer edition of the Nouveau Projet 09 magazine. First prize (English criticism) was awarded to “Growing Pains,” by Kristen Smith, a 22-year-old architecture student at Ryerson University, in Toronto. Her text, on Ryerson’s brand-new Student Learning Centre (SLC) designed by Snøhetta & Zeidler partnership architects will be published in an upcoming edition of Canadian Architect. The two winners each received a $1,000 award and a two-year subscription to the Canadian Architect magazine. All of the entrants will also receive a digital subscription to the magazine. The highly regarded submissions of two other budding critics will soon be published in Argus, the leading French-language magazine for Quebec librarians and information professionals. They are: (French) Pascale Jetté, 28, architect at Lemay Michaud, and (English) Samuel Dubois, 26, a graduate architecture student at Ottawa’s Carleton University. The jury also gave mentions to the French-language submissions of Alexandre Hamlyn, René-Maxime Parent and Alexandre Petitpas, and the English-language submissions of David Rudin and Magdalena Milosz. The future of architectural criticism is clearly in good hands. It is now up to mainstream media directors to step up to the plate and make room for the contributions of architectural critics. Congratulations to everyone involved! The Maison de l’architecture du Québec wishes to thank the Phi Centre, the Royal Architectural Institute of Canada (RAIC) and the Laboratoire interuniversitaire d’étude de l’architecture potentielle (LEAP) group dedicated to research on the design process in architecture, whose support made this event possible. Thanks also to Nouveau Projet, Canadian Architect and Argus, who have committed to publishing the winning submissions. Nicolas Langelier, publisher and editor of Montreal’s Nouveau Projet magazine, well-known Vancouverbased writer and critic, Adele Weder, and Maria Cook, manager, Communications and Advocacy at the RAIC. Returning jury members included Roland-Yves Carignan, former managing editor and artistic director of Le Devoir (Montreal), Sophie Gironnay, architectural columnist and founding director of the MAQ (Montreal), Elsa Lam, editor of Canadian Architect (Toronto), and David Theodore, professor at McGill University and a regular contributor to Canadian Architect and Azure (Montreal). The Maison de l’architecture du Québec (MAQ) artist-run centre has been a catalyst for architectural creativity since 2001. It promotes the development of architectural culture in Quebec and Canada in line with today’s practitioners through exhibitions, laboratories, publications, workshops, discussions and educational activities. Located at 181, Saint-Antoine Street W. in Montreal, it features two exhibition spaces and advocates for the recognition of urban planning and landscape architecture as major art forms and an essential part of everyday life. The Royal Architectural Institute of Canada is the leading voice for excellence in the built environment in Canada, representing about 5,000 members. The RAIC advocates for excellence in the built environment, works to demonstrate how design enhances the quality of life and promotes responsible architecture in addressing important issues of society.